How much fun is this little stamp from Penny Black. 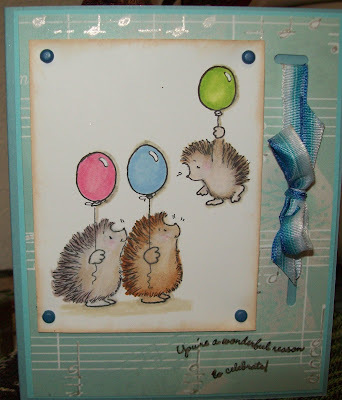 I'm in love with little Hedgies (no matter who makes them -- they ALL CUTE)! I colored this with my Copics and shaded the edges of the main image with Cat's Eye. The little "music" dp is a freebie that I got out of a magazine and thought it would perhaps look like "Happy Birthday to You, Happy Birthday to You" etc. etc. The sentiment is the curvy verses from Stampin' Up "You're a wonderful reason to clebrate!". The ribbon is a wire ribbon which is probably why it stands up so well! I just love these little guys! Great card.